Extreme Notch Weighting redistributes weight to the extreme perimeter of the iron to create a high Moment of Intertia for greater forgiveness and more stability. 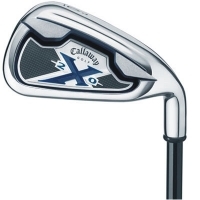 Progressive Wall Reduction System enables Callaway Golf engineers to lower the center of gravity 6 percent more than in the X-18 irons for improved feel and playability. 360-Degree Undercut Channel maximizes perimeter weighting by moving the CG lower and farther back in the clubhead, enlarging the hitting area and stabilizing the clubhead for more forgiveness.